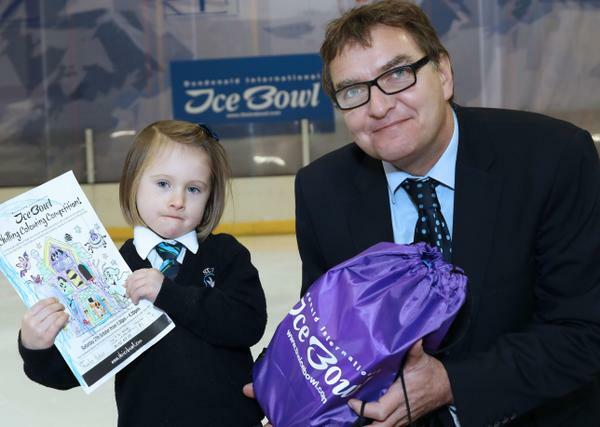 Over twenty primary schools participated in a Schools Colouring Competition to win a day out to Dundonald International Ice Bowl. Open to school children from Primary One to Primary Three, judges at Dundonald International Ice Bowl were overwhelmed by both the number of entrants and the creative skill displayed on some of this year’s entrants, with some children incorporating glitter, pompoms, feathers and more in their design. Following difficult judging, one winner was selected from each Primary school year. The winners were invited to Dundonald International Ice Bowl for a congratulatory lunch, where they were presented with their prize by Operations Manager, Mark Kane. Pictured with Mark Kane is the Primary One winner, Amelia, from St Ita’s. Well done Amelia, you are a Star!